Advocates with the citizen group The People's Right argued at the Matheson Courthouse that lawmakers' overhaul of Proposition 2 was an overstep of their authority. The Utah Supreme Court is considering whether to overturn the state Legislature’s replacement for voter-approved Proposition 2 that expanded patient access to medical marijuana. Advocates with the citizen group The People’s Right argued before justices at the Matheson Courthouse on Monday that lawmakers overstepped their authority when they overhauled Prop 2, less than a month after 53 percent of voters approved the law via ballot initiative. “So very clearly, what the citizens wanted under Proposition 2 ... has been thrown out the window,” said Steven Maxfield, one of three co-plaintiffs defending their case. Maxfield told justices the rewrite was part of an established pattern by the Republican-led Legislature, which he said has passed “ever increasing and hostile restrictions” on the initiative process. During the hour-long hearing, justices peppered Maxfield and his co-plaintiffs over whether the case had standing in court, or would be better left to the political branches. 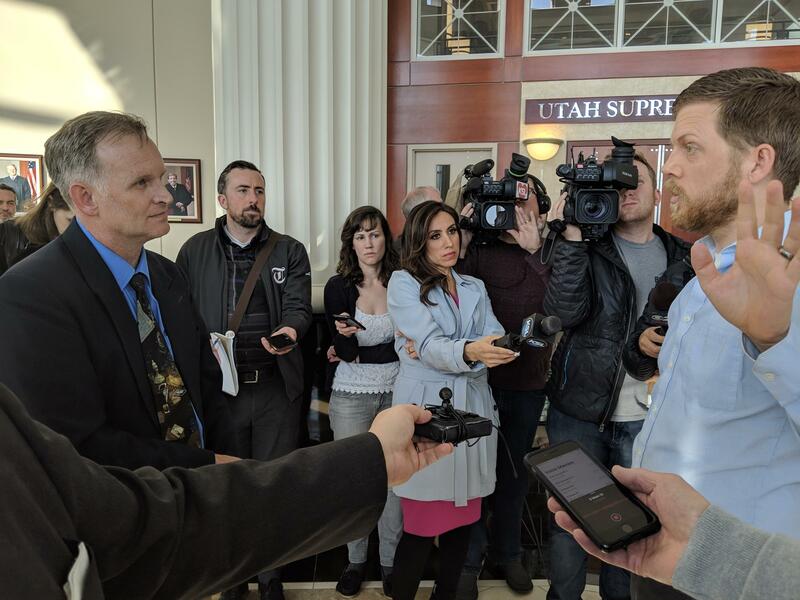 Hear oral arguments from the Utah Supreme Court Hearing for Grant vs. Herbert, recorded Monday, March 25, 2019. “[The] separation of powers recognizes there are certain times when the court stand down as well,” said Justice Deno Himonas. “Absolutely, but I don’t believe this is one of those times,” replied Steve Maxfield. Attorneys representing the governor and Legislature argued that while the state constitution gives citizens the power to create legislation, it also allows lawmakers to amend them. Stan Purser with the Attorney General’s office said this authority isn’t limitless. “[Citizens] have the power to initiate legislation, which this court has long recognized is qualified. Likewise, they have the powers of referendum, which is also expressly qualified by the terms of the Constitution. So I don’t see a conflict,” said Purser. But justices were equally aggressive in questioning Purser and his co-counsel over whether the Legislature’s ability to amend a ballot initiative was actually just another way to repeal it. “If the the Legislature can effectively change anything that the people pass, has that nullified that right? Is it essentially an empty power?” asked Justice Paige Petersen. Connor Boyack (right), who helped rewrite the law replacing Prop 2, debates Steven Maxfield (left), one of the plaintiffs challenging the law. Connor Boyack, president of the Libertarian think tank the Libertas Institute, attended Monday’s arguments. Boyack was one of the chief authors of Proposition 2 and later the replacement law, which he negotiated with state lawmakers to preserve access to medical cannabis. “We know that they [The People’s Right] will likely be unsuccessful here in the court, and for that very reason we decided to negotiate with the Legislature because we knew at the end of the day, the court would defer to their existing and inherent authority to amend what the people did,” he said. Outside the court, Boyack and Maxfield briefly debated each other over the merits of the case as reporters recorded them. Maxfield said without a court intervention, he believes lawmakers will have carte blanche to continue making changes to initiatives regardless of public opinion. “Since you admit that the process is flawed — that basically the Legislature is the only game in town, are you okay with it?” asked Maxfield. The justices will not issue an immediate ruling as they take the case, titled Grant v. Herbert, under advisement.